At Keenair we provide a total solution for owners of aircraft, leaving you to focus on making the most of your flying time. Our engineering staff, some of which have been with the company for over 20 years, have a wealth of experience working on a whole range of aircraft (see "Aircraft Types" below). With their knowledge, professionalism and friendliness we pride ourselves on customer safety and satisfaction. For those aircraft away from our Liverpool base that require maintenance, we can provide a pick up and delivery service by our experienced pilots. The landing fee at Liverpool is free of charge. Competitive fuel can also be made available to our customers. 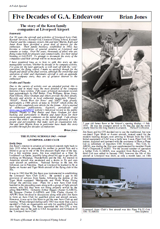 The Keen family history at Liverpool Airport is well documented in aviation, commencing in 1963 when the Liverpool Aero Club was established by the late Jim Keen. Since then the Flying School has been training pilots, for business and leisure. The requirement to maintain this fleet, as well as customers' aircraft, was taken up by Keenair. Approved to maintain your aircraft and carry out the Star Inspection for recommendation to renew the Certificate of Airworthiness. Douglas C-47A Dakota "Maggie May" & "Drag em oot"
B-2SJ Mitchell "Big Bad Bonnie"